I have long been fascinated by the folklore of the beckoning cat, and have wanted to carve one for some time now. 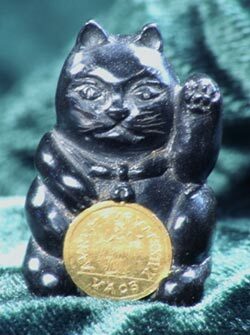 I also like the image of the black cat with the gold coin. In this case the cat is carved from a block of jet, a variety of carveable coal. The coin is slightly oval, and the front of the cat was made so that I could insert the coin and turn it until it stuck fast. I was playing around with a chip of jet one day when I noticed that it was roughly the shape of a kanji character. I don’t know why, but the rest of the project just followed from there. 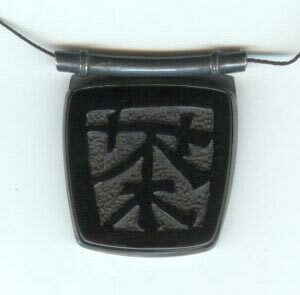 The carving is set in blackened silver, and is padded with tea leaves pressed into the setting. I made this piece to commemorate my first trip to Alaska. While there I was injured crossing a river on a fishing trip. 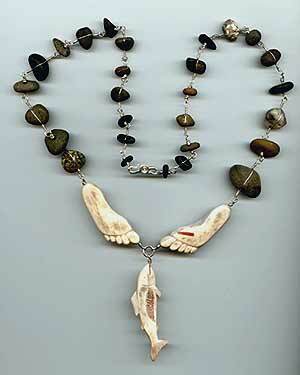 My left foot was crushed between the rocks so that the skin was broken on the bottom. It was quite painful, so I just waded barefoot out in the cold water, to keep it clean, and keep the swelling down. I caught a big female salmon, which I smoked and ate. I think you can see all of that represented here. 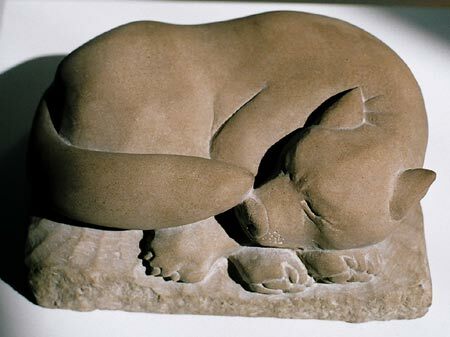 In this sculpture I wanted to convey the way that dogs sleep, with the paws folded together, and the way they dream with all the little twitches of the face and feet. I have always loved both spirals and cordage. In this case I wanted to make a sculpture that had no definite front or back, top or bottom. I cut a groove around the middle of the stone, and worked the cedar bark tight inside it with one end forking like seed leaves, and the other dividing over and over again like roots. 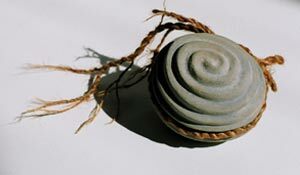 The stone itself is a concretion, that is a stone nodule that forms around a shell long buried in mud and sediments. 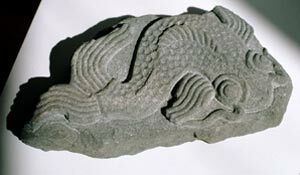 This one is a shallow relief carving of a fantasy fish that was suggested by the shape of the stone. This is a smallish trial piece, a keystone about the right size for the shorter sort of red brick. 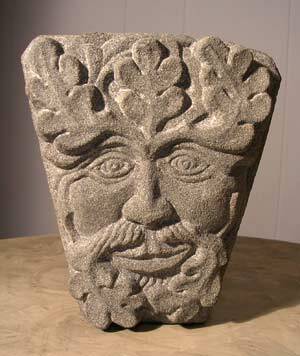 I wanted to work out the details of carving the stylized leaves, and making them work with the facial features. I would welcome custom work of a similar nature. More carvings here: Octopus, Other fish,etc. If you have questions about any of my work, or want to see more detailed images of any of the things you see here do not hesitate to contact me.